Sometimes, it pays to go further afield in search of forward economic indicators. The data doesn't lie. 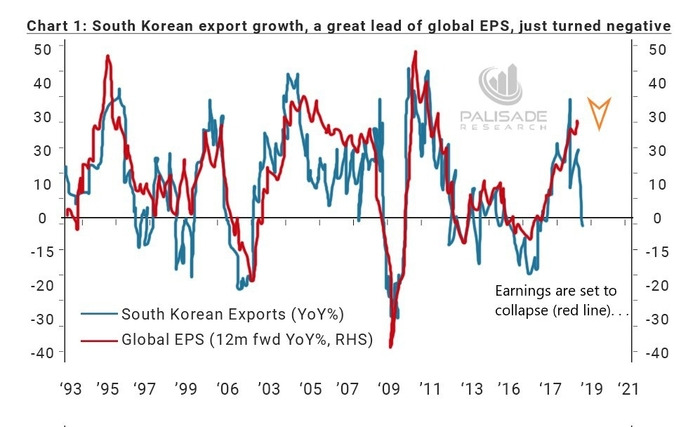 The 'why' is less important than the simple reality that when South Korean export levels fall off a cliff, global EPS follow with an unerringly direct correlation. One after the next, market fundamentals are deteriorating rapidly, and all the forestalled market pain the Fed has tried to put off forever is straining at the dam. Another situation signaling trouble ahead is a little-followed indicator – but is eerily accurate. The South-Korean Export Growth (SKEG) Indicator. Many wouldn’t have guessed that South Korean exports are a great leading indicator of global corporate earnings (EPS). But historically – it is. And right now, the SKEG indicator just turned negative. I should also remind you that the last time the SKEG indicator dropped this steeply negative was around the time China devalued their currency – the Yuan – in January 2016. Sending global markets spiraling and causing the Fed to tone back their hawkish attitude. Also, gold ended the multi-year bear market it was in and rallied over $300 during the next few months. If the SKEG indicator continues its accuracy – as it always has if you study the chart above – then we can forget about the mainstream media’s view of soaring earnings in the coming months.